Today we are going to discuss Types of Electrical Transformer which are the most costly protection system of the electrical system. As all we know transformers are generally used to step up and step down the voltage level. Since transformer working under several voltage levels, it’s also require to have better protection in the transformers. There are the several type of transformer faults occurs and it can mainly divide into Internal faults and through faults.Internal fault of the transformers mainly happened due to the insulation breakdown of it.Insulation breakdown create short-circuit conditions inside the transformers. This will cause hazard situations so we need to special attention on this type of transformer fault. Transformer are use to protect on several kind of phenomena such as following. Overcurrent protection of the transformers can done by using fuses , circuit breakers and relays. Protections systems are use as primary protection system of the transformers. Differential protection of the power transformer effect on the different current. This also should consider while apply a differential protection. The factors can also result in differential current in under balanced power conditions. Following are some of the situations which can occur. Primary and secondary different voltage levels. Differential relays are used to reduce the mention effects of transformers. The percentage characteristic of the differential relays are vary in the rage of 15% to 60%. in Addition to that the modern microprocessor and numeric relays and harmonic restraints can apply in to it. Measurement of harmonic of the no load current. Buchhols relay are one of the protection system which is really important in electrical power transformer. Normally there buchholz relay are gas actuated and its installed in oi. This protection equipment is used to immersed transformer for protection against all kind of faults. In transformers following methods are used to protection against the lightning such as. 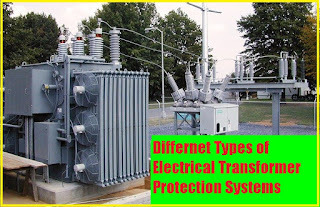 Following are the most commonly use transformer protection types which use in electrical transmission system. Biased differential protection of two and three winding transformers. In this article we have discuss the basics of transformer protection systems such as Over current protection , Differential Protection , Differential Relays ,Buchholz Relay Protection and Transformer Lighting Protection. Hope that you have gain some good knowledge about it.